Lieutenant Colonel Thomas Edward Lawrence (T. E. Lawrence, 1888-1935) was an undergraduate student at Jesus College, Oxford and then worked as an archaeologist in Syria. He joined the Military in 1914 and became renowned for his liaison role during the Arab Revolt of 1916–18. Seven Pillars of Wisdom is his account of the desert campaigns. He wrote most of it while he was a fellow at All Souls College. In the years after World War I ‘Lawrence of Arabia’ became a popular hero, a role he did not entirely approve of. The basic Arab male dress is a long, white shirt thob, sometimes embroidered at the neck. 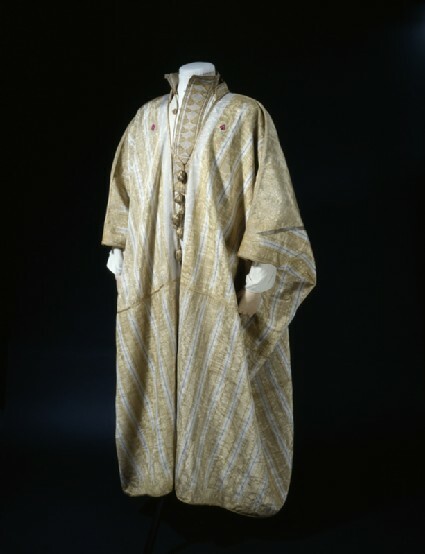 Wealthy men wear a second robe zebun over it. 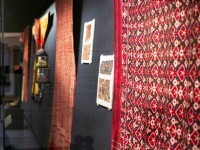 The headcloth is held down with a heavy decorative rope aqal, here made of gold thread wound around a silk core. Presented by Dr M. R. and Professor A. W. Lawrence, 1965.